Now this was a book that I could enjoy reading! It's about time! 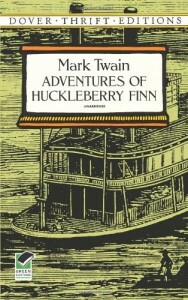 What I love the most about Huck Finn is that it's a simple story, with nothing too over the top plot-wise. You've just got a kid who ran away from home, floating down the Mississippi River on a raft with a slave who's running away because he heard he was going to be sold down South. And, well, that's about it! They talk, they run into people, they experience different adventures based on the towns they pass and the people in them, and it's a learning and growing experience for our main character, Huck, which says a great deal for those of us who have experienced the single-mindedness of Tom Sawyer. *Snorts* For one thing, when Tom Sawyer appears in this book the couple of times you see him, not only are you shocked by the manner of his thinking and the utter nonsense he pulls everyone into, but it just made me mad that he was so over-the-top and made everything a MILLION times more complicated than it needed to be! Arg! Okay, so towards the end it all played out for the best, perhaps. But STILL. The kid needs to seriously be smacked upside the head for being such a jerk of things! He's a smart kid, and he knows how to take advantage of others. That's been his thing since anyone's first met the character. But it can get reaaaally frustrating to those of us that don't know that we're being put on or why we're doing things so lengthy and miserably intense when the easy solution is sitting RIGHT THERE. I definitely feel that there was a great deal of charm to this book however. The way that Huck and Jim act and interact is always fun and delightful, and half the time it's a wonder watching Huck learn so much from being with Jim over this long journey. You get to just sit back and enjoy everything as it unfolds. And when there are intense, life-and-safety threatening things going on, you're pulled to the very edge of your seat with anxiety for these characters that have come to mean so much to you, that's you're almost unaware of how it happened or at what point you started to really and honestly care about them. But I think that's part of the charm of Mark Twain's writing here, because that's the exact same way that Huck experiences his attachment to Jim: not knowing if he cares, or how much he cares, until all these different events come along and put him in a hard place, where he has to make some life-changing decisions--not just for himself either, but ultimately for Jim as well. It shows his character, how strong he is, even when he feels he's lost most of the time, or guilty of one thing or another that is really tied to him in no way. We've got to remember that Huck's just a kid, but he's a kid going through some majorly adult decisions a lot of the time, and a kid that's been through a lot just from the way you see him react to certain things. This is a boy that's been around and knows the world, even if he isn't an expert in it, and even if he isn't the most educated. I think, in part, it's this lack of any strict education or upbringing that makes Huck the wonderful character that he is: because he's got much less to influence him besides his own feelings, and his own logic, and his heart. He's a kid that uses his brain, and that makes mistakes, but he sure as the sun rises does his best to figure his way out of things--and he CAN too, what's more! He's capable, even though he's nothing special at all. And it's this great ability of his to choose what he feels is best over anything else that truly made me admire his character. That's why, when Tom Sawyer got involved and Huck once again became a secondary, if not background character even, I was ROYALLY steamed! This was Huck's story! It's got HIS name on the book! And Tom Sawyer just has a way of waltzing in, destroying everything that we just achieved, and stealing not only the show but the spotlight itself--permanently. From the moment Tom once again enters the picture in the latter part of the book, we lose everything that we gained throughout the story, and that's what frustrates me so IMMENSELY. And it kills me too, because Huck just goes right along with it, like it's no big deal. He sits there and goes right back to thinking all those things he's been probably told all his life: that he was born bad and will stay bad; that he's not smart, and he'll never be smart enough to out-do others; that he's nothing special, and so he's not going to try to be anything special. And it just irks me to see him like that! I feel like if he had the chance to be on his own with Jim for a time longer, that he would have grown so much more, so that maybe someday, this attitude that he's nothing at all would disappear, and he'd take claim of the fact that he is somebody strong and worthwhile! Who knows what's going to happen from here though. Readers, I definitely think this is a book that most people can enjoy. It's got a few things in it that I think are meant to be blatantly grating and even insulting, but that's how we learn and begin to think, and I know that's how Mark Twain intended it to be read and thought about. Take a chance on it if you haven't read it before! It's one of the better reads in the batch of Classic literature we're all told to read, I feel! And I hope you enjoy it as much as I did~!